Mobile finance apps may really help change people’s financial behavior for the better. 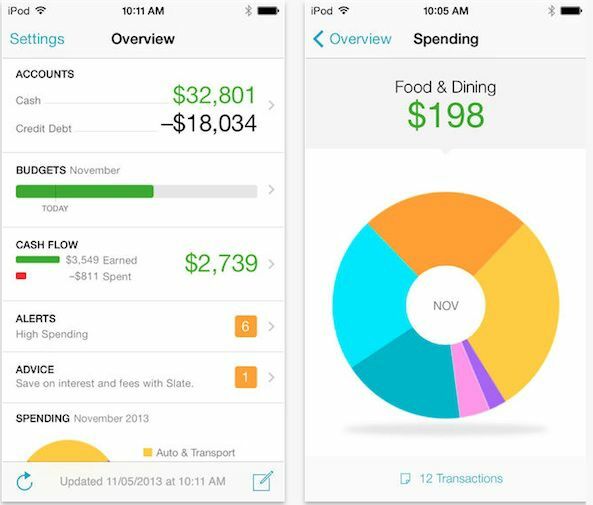 The Mint Personal Finance app is considered to be one of the most efficient budgeting apps. If you pursue the goal of creating something similar, you might be wondering what Mint is all about. The Mint finance app was built by Aaron Patzer for the US and Canadian markets. In 2009 Intuit, the developer of financial and tax preparation software and related products, bought the company for $170 million. Other popular products Intuit owns are the tax preparation software package TurboTax, an accounting program Quickbooks, and Quicken, which is a desktop personal money manager app that runs on Windows and Macintosh and has iOS and Android apps, but doesn’t integrate with web-based Mint. The Mint.com website together with Mint Personal Finance app for iOS and Android, became a great contribution to Intuit’s family. Today the app has over 15 million users and is one of the most trusted finance planning applications in the North America. When I looked at why people love Mint, I found that most think it’s a great product — excellently designed, easy to use, secure, and free. If your finance app development spares users from the obligation of entering finance data manually, it has a huge chance to succeed. The Mint finance app does all the work for the user, from letting them see a full picture of their finances in one place and gives advice on how to save money. Users typically have a variety of different accounts which may include bank accounts, credit card accounts, investment accounts, loans, and other consumer or business accounts. The Mint app links to the respective website which automatically pulls all of these different user accounts into one place. Access to financial information comes directly from the bank, investment firm or other finance company, and is as safe as its origin website. In order to connect all accounts online one should use account aggregation technology, either self-developed or integrated from a reliable source. Mint used to provide account aggregation through a deal with Yodlee, but has since moved to using Intuit, which developed a proprietary aggregation technology of its own. The Mint app currently works with US and Canadian financial institutions only, so unfortunately I couldn’t see what my accounts would look like in the app. When you sign up for Mint, you allow the app to manage money by getting access to your bank accounts. This also means that you let the app download transactions which get categorized on a daily basis based on the vendor’s name and / or how you’ve categorized a similar transaction in the past. So how does Mint know which category your transaction fits into? Mint already knows several million merchants because they use Yellow Pages data categorization service, which provides a means for finding businesses close to a particular location. The underlying data maintained in the Yellow Pages search engines are typically labeled according to Standard Industry Classification (SIC) codes. These codes are four digits assigned by the U.S. government to classify industry areas (also used by agencies in other countries) and identify the primary business of the establishment. Mint has hundreds of categories but can sometimes make a wrong guess. For example, if you stopped by a Shell station to buy gas, the app may categorize this purchase as Gas & Fuel and not as Auto & Transport. In this case, you can easily edit the information in the app. I assume Mint also uses machine learning technology in their categorization algorithm, so that that the data categorized manually by other Mint’s users are added to their transactions categories. Users can’t modify existing standard categories, but can create their own subcategories. They can also enter purchases made with cash manually. Mint has a geolocation capability in the app to help instantly match a transaction to a point of purchase, so users can simply choose a merchant from those found nearby to register their recent spending. The amount spent is automatically deducted from the most recent ATM withdrawal, so the cash balance is kept accurate almost up to the minute. The Mint app’s development technologies for iOS and Android go beyond simply tracking user expenditures. 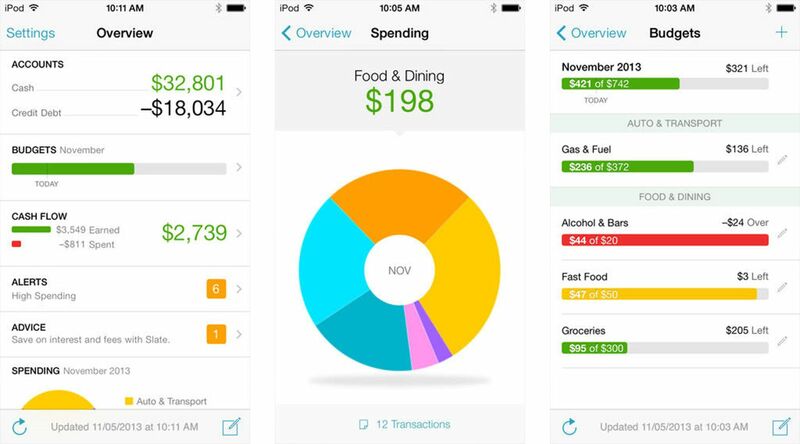 The app lets users create and monitor their budgets, which can be set for each spending category. The system will recognize a transaction that falls within that budget category and automatically update it. This feature helps the user save money and at the same time, increases the app’s engagement metrics. Users get regular alerts when they’re exceeding their budget. Mint offers great notification options in the form of emails and push alerts. Users can set up notices for low bank account balances, large or unusual purchases, bill reminders, bank fees, over budget alerts, or even an alert when there’s been a change in their interest rate. They can increase or decrease budgets on the go and see how they are spending money across different categories. Mint tracks how the user is doing over time and displays this information graphically. It provides diagrams such as, colorful pie and bar charts for different time periods, and graphs, which are easy to understand and, therefore, create a positive user experience. In the Trends section of the app, Mint compares user saving and spending habits to those reported by other Mint users. This feature is attractive since it adds a bit of gamification to the app and can potentially be used as a resource for user gratification strategy. People don’t just spend money, they also save it to buy something important. 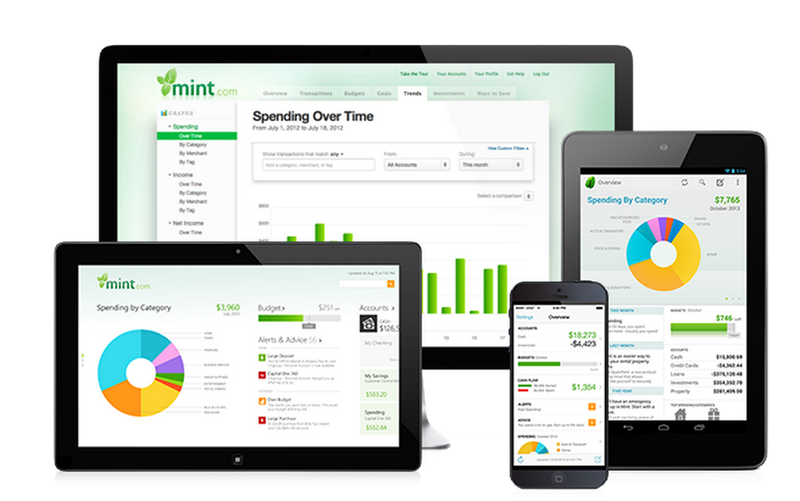 Mint did a survey and discovered that users have eight common financial goals. These goals include getting out of debt, buying a house / car, saving for a trip, an emergency, retirement, or college. 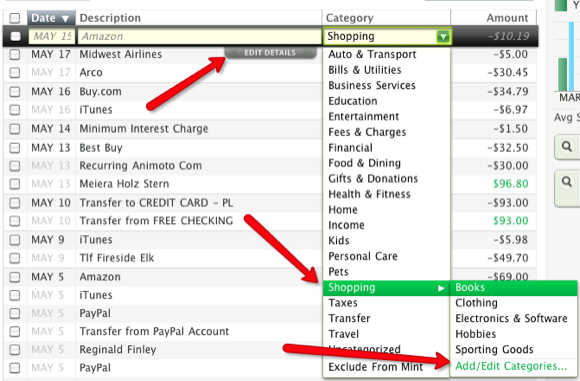 Mint puts all these on the shelf and lets the user choose an existing one or create a custom goal. In order to set up a goal, the user will have to answer a range of simple questions, like «how will you pay for the project?» «how much will it cost?» and so on. If a user wants to buy a car, for example, Mint will estimate the price based on the value designated by Kelley Blue Book, a vehicle valuation and automotive research company, taking into account the desired make, model, year and condition. When the goal is set, Mint will provide a guide on how you should budget and distribute your paychecks as well as offers specific ways to cut back in certain areas to save more cash. Mint’s Buy a Home guide, for example, offers recommendations on how to improve your credit score, understand your loan options, shop for homeowners insurance, etc. Mint only allows its users to set a single goal at a time, which is a downside since users normally have several goals. 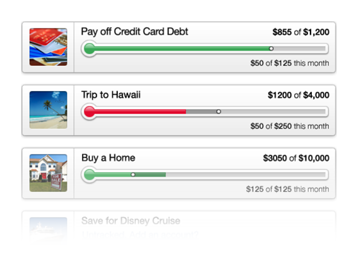 You can read more about setting and tracking financial goals on the Mint blog. The Mint finance app is free but it does have ways of making money. The source of monetization for Mint is its Ways to Save tab. By analyzing specific items in the budget, Mint offers their users better alternatives that can help them save money. They simply compare prices and interest rates to those on their partner sites and get a referral fee from each customer. For example, if you’re paying too high an interest rate on one of your credit cards, Mint will search other cards you qualify for and recommend them to you. Advertised offers from affiliate establishments Mint partners with can irritate users, who don’t want to deal with that. But all in all it’s a very smart monetization plan. Mint also uses aggregate financial data to do comparative budgeting and sharing statistics, like consumer spending, and might even sell these data to third parties for their research, marketing and promotional purposes. There is no violation of security since these data are the sum of a particular group and are collected anonymously, and cannot be traced back to an individual user. «We may share or make available anonymous or aggregate information that cannot be used to identify individuals with,» Mint says on their Privacy page. The Mint app connects with the Mint.com website, which claims to protect user names and passwords with the same level of security as a financial institution. Sensitive user data are stored in a separate database using multi-layered hardware which corresponds to the physical security standards banks use and 128-bit SSLsoftware encryption. They’re also verified and monitored by third party experts such as TRUSTe, VeriSign and other stalwarts of online security. Even if somebody has your Mint.com login, they won’t be able to access your bank account information. Mint only «reads» user information, which means no one can move money or modify bank accounts using the Mint app or website. Account information is encrypted and stored on Mint.com’s servers. According to Aaron Patzer, it’s a bigger threat to store your data on your personal computer, than on the fully protected and constantly monitored Mint server. Users can access their accounts from a smartphone, tablet or the Web, since their information automatically syncs across devices. If you lose your mobile device, you can log onto your Mint.com account and deactivate device access. The Mint Personal Finance app is not the only app Mint.com owns. 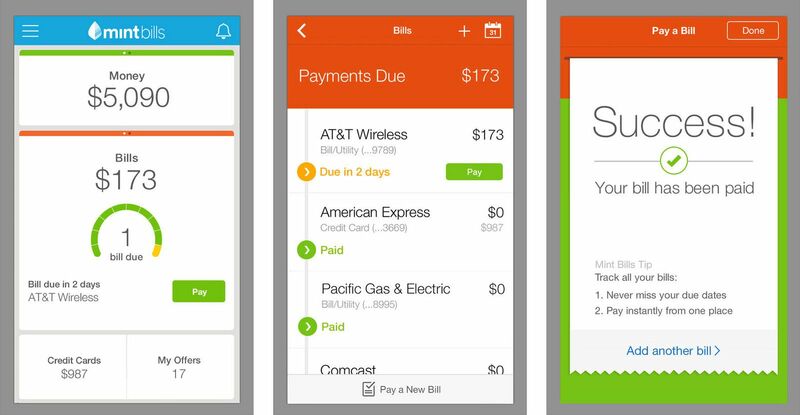 One more interesting solution is Mint Bills, a separate app which helps users schedule payments and gives them reminders when bills are due. It also allows for the actual payment to occur from within the application. Mint Bills is formerly Check which was Pageonce before that. Intuit acquired it last year. This product allows Intuit to deepen its payment functionality. According to PcWorld, Intuit plans to pair Check’s mobile service with Quicken and Mint.com. So I’ll probably write more about this interesting company in my next blog posts.